Early morning of 3rd August, I woke up with the thought “Yeah! 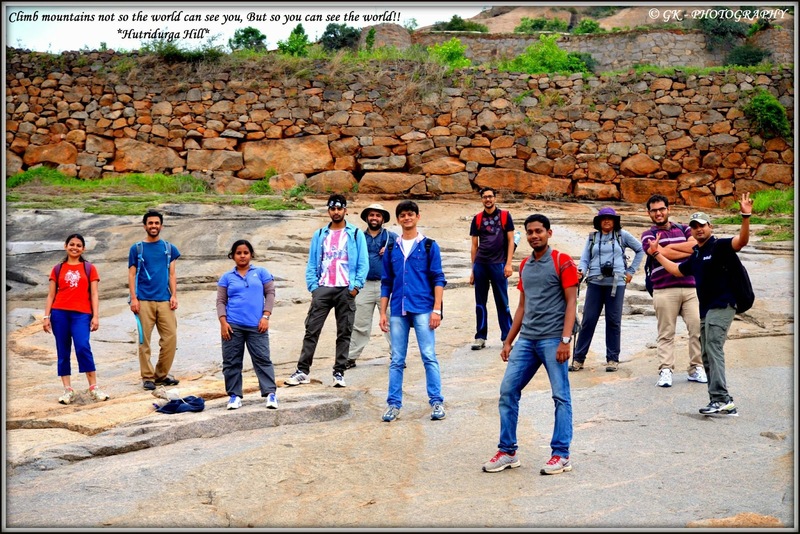 It’s finally Sunday!” and got all set for the trek of the day to Hutridurga. 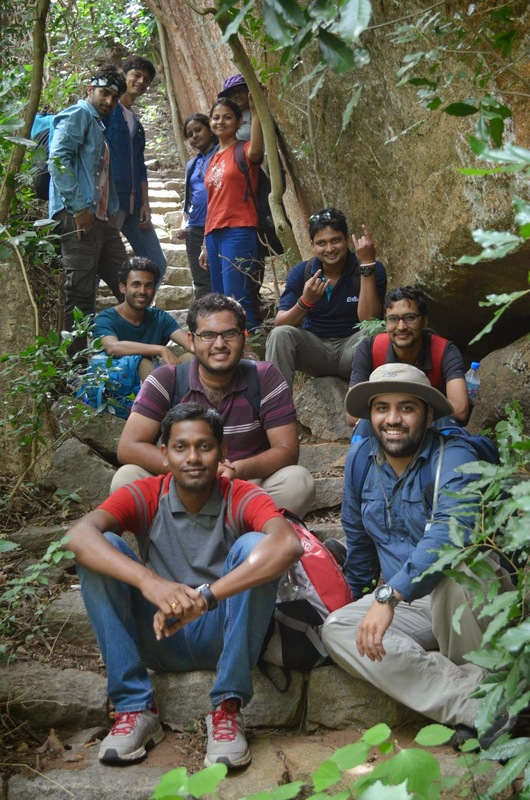 All the participants of this trek, which included Geetha, Sushila, Hiren, Srikanth, Vikram (Betaal), Gaurav, Purvik, Sundeep, Nir, Rishi, Rishikesh and myself, gathered in front of Shantala Silk House in Majestic and started waiting for the TT to arrive. But lo and behold, the TT driver ditches us! So Hiren expected us to fight with him, shout at him, hit him and back out from the trek :P but nothing of that sort happened. Everyone agreed to take the public transport and so we proceeded to K.R. Market to catch a bus to Magadi and embark on our mission of the day. After some asking around, we finally boarded a bus and settled down. The journey was made interesting with the trademark game of BTC: dumb charades…I learnt about some very interesting movies like ‘ReshmakaJanaza’, ‘Khoonmein tale hue Samose’and ‘Do-n Muh-thoooSwamy’ which were acted out with even more creativity. BTC treks do increase your general knowledge! But once the bus got crowded, sadly we had to stop the game. Everyone tried to get some sleep, but from what I could see, only Rishikesh was successful :P.
Finally we reached a place called H – cross and had fresh traditional dosas and vadas for breakfast. After refreshing ourselves with ‘no coffee’ and packing lunch, we proceeded to the base of the hill on the trustworthy tum-tums. 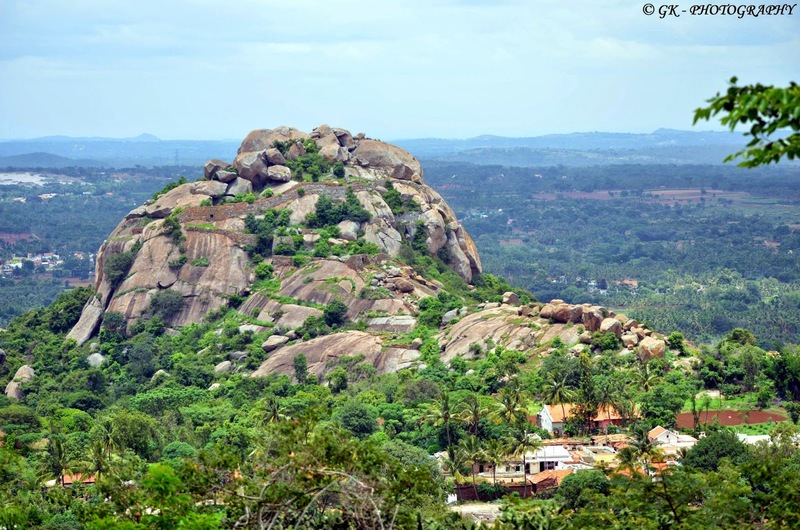 Every hill on the way was named Hutridurga by us till we reached the real Hutridurga with a small temple at the peak. After forming a ‘straight circle’, introductionswere made and instructions were given out. Then what else but start the trek! Gaurav, walking at the end insisted on clicking our photos and so everyone gave him some failed jumping poses. After filling our stomach with lemon rice and vadas, it was time for some more fun and so everyone decided upon playing ‘passing the parcel’. In this game, everyone sat in a straight circle once again and Rishikesh’s cap was passed around in the circle till a music played. Once the music stopped, the person holding the cap had to do a task decided by the group. It was time for some fun!!! Stellar performances were given by everyone especially by Nir and Rishi. Rishi was given the task of giving a speech in Hindi with the phrase “Cholle (bribe) de kar” after every sentence which he did very wittingly and had everyone laughing and clapping. Gaurav presented a modified version of his famous ‘fish story’ which was supposed to be very scary and give everyone the creeps but it didn’t :P. Sushila sang “Kabhi kabhi mere dil mein” and all of us joined in. Purvik gave some serious competition to Katrina Kaif with his moves on ‘Chinkni Chameli’. The winner of the game was Srikanth whose task was to threatenHiren with some telegu bullets :P.
5. Using a hard object, like the back of a pen or your mobile phone, hit the part, where the fold is, for about 8 – 10 times. 6. Next open the note completely and look at Gandhiji’s photo. If the spectacles have not cracked then the note is a genuine one!!! While I was serious at first looking at Gaurav’s straight face, continuous giggling on part of Vikram (Betaal) made me suspicious and by the end we all burst out laughing! 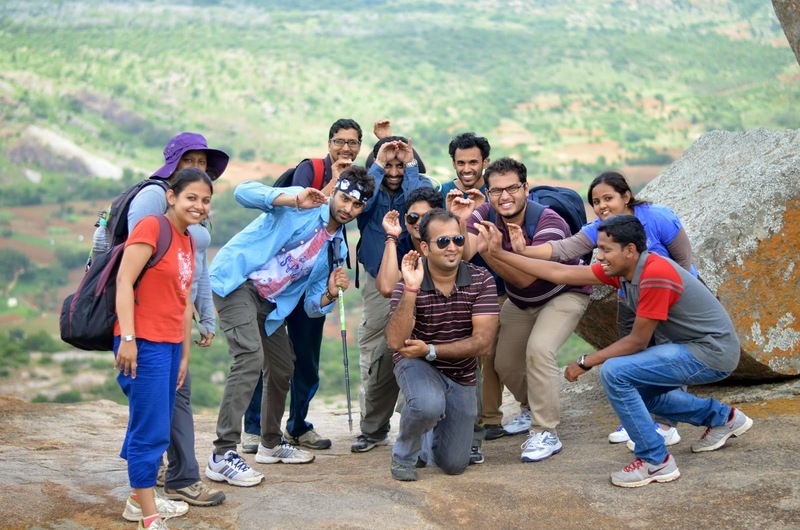 One thing I have surely learnt in this trek is – never take Gaurav seriously!!! All in all it was a wonderful trek! Kudos to the organizer, Hiren, who alone handled everything and ensured that everyone was comfortable throughout the trek.Initially, with a participation of only 12 members, I was apprehensive about how the trek would go but the fewer number only made it easier to interact and know each other better. I made some new friends and got to know some people better. It was one of the best treks I have had with a great team. 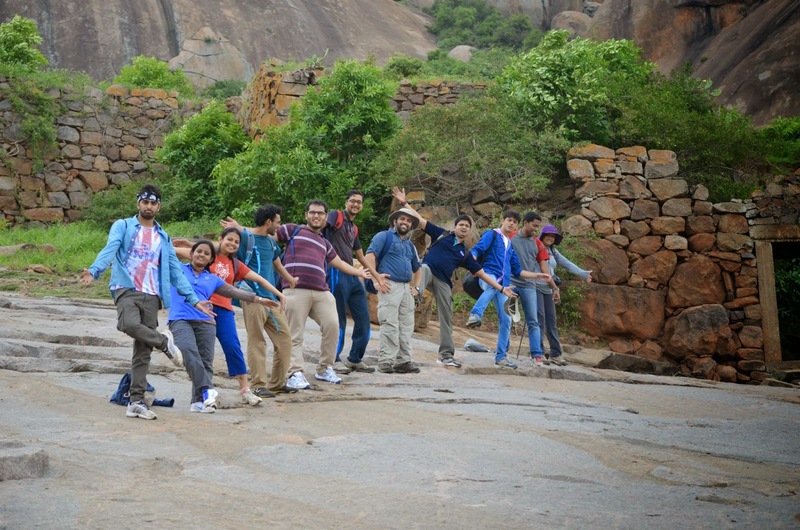 I look forward to many more such treks with BTCand meeting many more such lovely people. Till then, Hasta la Vista!